If there’s one thing the character design class I took in college stressed more than anything else it’s that a good character design informs the viewer who the character is, what they are like. What they wear, how they stand, how they do their hair, the shape of their face, their standard expressions, what they carry with them, these are all vital decisions in a good design. If these are all vital decisions in a good design, then what’s going on? Why has Disney’s Consumer Products Division changed what Merida wears, how she stands, how she does her hair, the shape of her face, her standard expressions, and so on? Bogart explains that the changes found in redesign are not about the translation from 2D to CGI; rather, it’s a deliberate effort to make Merida fit the passive, pretty princess trope that dominates the Disney Princess line. When you market a character you have to boil them down to their essential elements. […] [Merida] was depicted in trailers and posters as strong, determined, adventurous, beautiful, and heroic. This redesign de-emphasizes those qualities and pushes for a Merida that is more glamorous, sassy, and passive. taking the established Merida design from the film and re-imagining her to more closely resemble the typical damsel in distress that the Disney princess line seems to champion. We all know that multitudes of artists work on these characters and the very nature of merchandise (with all its differing surfaces and sizes) necessitates changes to permit an acceptable level of familiarity across the range. Well, normally it isn’t a problem because the characters remain relatively consistent. In Merida’s case, however, the change is near radical. […] Merida’s case stands out [because] she’s undergone not so much a redesign but a transformation. Even by comparing her looks (and her measurements) one can deduce that she isn’t likely to exhibit the same character traits as her CGI original. We’re long, long past the time when merchandise had to look different on account of manufacturing technology and the like. Today, it’s possible to maintain a high degree of quality across the board. There really is no reason why a Merida doll has a different structure to her animated counterpart, or for that matter for a stock image of her on a T-shirt requires a redesign. 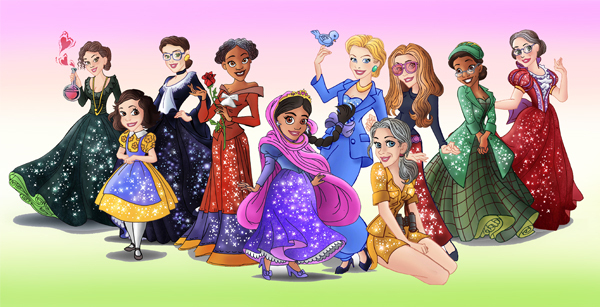 Heck, even the Disney Princesses themselves do not need such a standardised sense of design. What it amounts to is the merchandising or marketing division of the corporation attempting to stamp their impression on characters created somewhere else (by animators). It amounts to overstepping their boundaries insofar as they may adapt characters to their work, but outright changing them is unconscionable. In sum, the argument that Merida HAD to be changed this way is patently untrue. Since a picture is worth a thousand words, let’s leave the final words with a few cartoonists who have tackled the matter visually. To read my previous posts on Merida, click here. To read my previous posts on the Disney Princess brand, click here. Do you like this post? Follow Rebecca Hains on facebook or twitter. About the author: Rebecca Hains, Ph.D. is an associate professor of communications at Salem State University, where she teaches advertising and media studies. Her new book, Confronting Cinderella: Guiding Our Girls Through the Princess-Obsessed Years, will be released by Source Books next year. Great article…thinking back over the subject, particularly in reading your article…I realized that part of the reason this is hitting people so hard is that it is a PIXAR princess being wedged into the Disney cookie cutter. The massive disparity lies in the fact that Pixar has been so good at providing alternative hero moulds for years and years, from the feisty Merida to an old man in Up. The studio has even given us female heroins who are not humanoid at all, in the form of Dorey from Finding Nemo and EVE in Wall-E, strong plucky female characters who can have adventures and fall in love but don’t need to be turned into physical (and impossible) ideals. 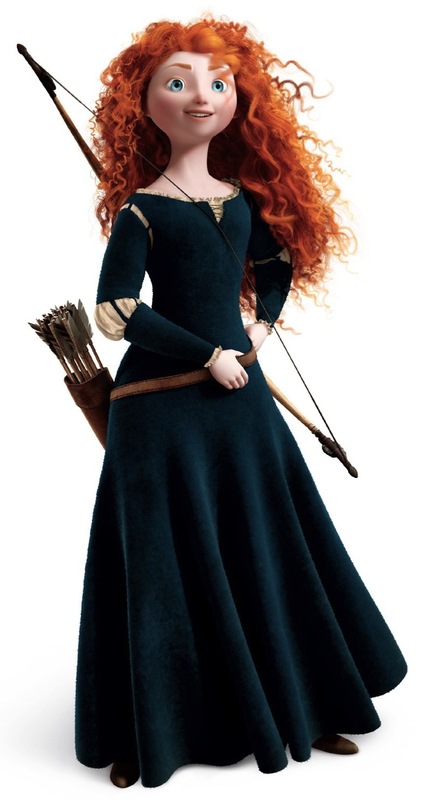 It says a lot about the high quality of Pixar’s output that Merida’s makeover has gone down the way it has. Thanks, David–and thanks for the terrific satire! I’m glad to have been able to include your cartoon in this post. Great post! I LOVE the new Batman! 🙂 Thank you so much for keeping the discussion going with a sense of humor! Thanks, Brenda. I appreciate that!! Reblogged this on Hummingbird Bones. Aren’t “sassy” and “passive” basically antonyms? 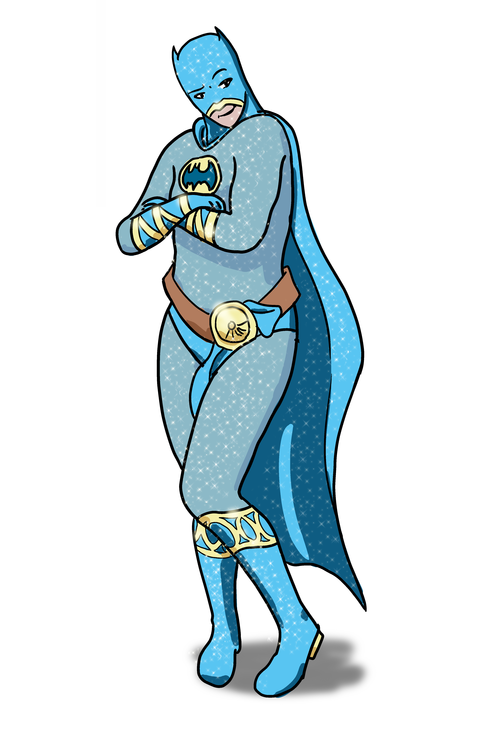 I bet Batman would look just as ridiculous drawn the way the “good” Merida was pictured (reference: https://rebeccahains.files.wordpress.com/2013/05/merida_web_small.jpg).